Julienned beets cook evenly because the pieces are all approximately the same size. A tumble of julienned beets is attractive and seems more festive than plain beet slices. Combine cooked beets with other julienned vegetables such as carrots and cucumbers for a fresh salad. Alternatively, add raw julienned beets to your wok as part of a stir-fry. They add an earthiness and sweetness to the dish, and the matchstick-size pieces cook as quickly as the other vegetables. Scrub the beets until the dirt and debris are removed from the surface. Cut off the tops and about 1/4 to 1/2 inch of the beet. Save the tops; they're edible and taste like a sweeter version of spinach. The red veins in the green leaves and stems stay red when cooked. Cut off the roots and about 1/4 to 1/2 inch of the beet at the bottom. The flat ends make the beet easier to cut into matchstick-size pieces because it doesn't roll around. Peel the skin off the beet with a sharp knife or a vegetable peeler. Place the beet root side down on a cutting board. Hold the beet with your nondominant hand. Hold the knife in your dominate hand. Cut slices off each side of the beet to form a square shape. Starting from the end of the beet farthest from your dominant hand, cut the beet into vertical slices no more than 1/8 to 1/4 inch thick. Pile the beet slices in the same order you cut them on the cutting board. Think of it as reassembling the square beet. Cut the piled slices into thin strips no more than 1/8 to 1/4 inch thick. Use the tool that slices a whole hardboiled egg to julienne a cooked beet. Prepare the beet by removing the top, root and peel. 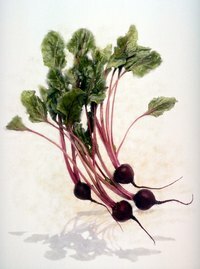 The beet should be cooked to tenderness; otherwise, the blades won't go through the beet. Place the beet root side down on the open egg slicer. Most slicers have a base the egg sits on and a series of blades on a hinged top. When you pull the hinged top down over the egg, the blades slice through the egg. It does the same thing with a cooked or canned whole beet. Gather up the slices to reassemble the beet. Put them back in the egg slicer, but give the beet a 90-degree turn so the hinged top cuts the slices into strips. Cooked and canned beets may be julienned with a knife, just like raw beets, instead of an egg slicer. Use a sharp knife when cutting raw beets; a dull one makes the job more difficult and increases the risk of cutting yourself.